Hard Cover, 192 pages, 8.5 x 11. No, you're not seeing double! 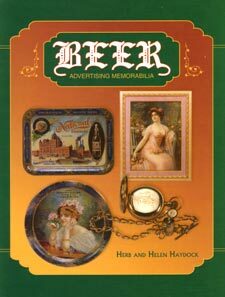 This is the SECOND edition of Herb & Helen Haydock's well-known breweriana book. Though the book cover is deceptively similar to their earlier work, this newer volume has a completely different lineup of fantastic old breweriana -- all pictured in full color, along with value estimates. It is simply another must-have book for breweriana collectors, from two of the most avid collectors in the hobby. Over the course of 40+ years, Herb and Helen Haydock built the phenomenal collection of breweriana that eventually became the basis of the "American Museum of Brewing History" at the Oldenberg Brewery in Fort Mitchell, Kentucky. The collection was later purchased by the Miller Brewing Company and moved to Milwaukee.